Peter's first single as a proper solo recording artist. Only the Japanese version has a picture sleeve. Click on cover graphic for large scan. All release versions are extremely rare. The New Zealand version was deleted very quickly after being released, resulting in the album not getting an Antipodean release. Quite interesting is that both songs were written by others, "Tears" is by Vinnie Cusano (aka Vincent), and "Jealous Guy" is a John Lennon song. Click on covers for large scans. 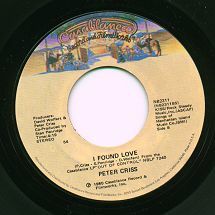 Criss' first and last single for TNT Records, a one track CD single. Click on cover for large scan. CD Single. Click on cover for large scan.